Treat your skin to a moisture boost. Following a specialist facial massage, the skin is fed with thirst-quenching actives that will bring back that healthy, dewy look to the skin. For perfect restoration of skin balance. Deep cleansing to draw out skin impurities, this facial will help reduce unwanted shine, refine the pores and treat skin breakouts. Peel away the years for smoother, more radiant skin. This ground-breaking anti-ageing facial instantly resurfaces and smoothes the skin. Clinically proven to visibly resurface by up to 70%* and increase skin smoothness by up to 32%* after just 1 treatment, this unique treatment targets blemishes, uneven skin tone, superficial scarring and fine lines, revealing a younger looking skin. Pioneering the precision layering of 3 targeted enzyme serums, this advanced resurfacing technique safely and effectively removes the thickening layer of the epidermis. 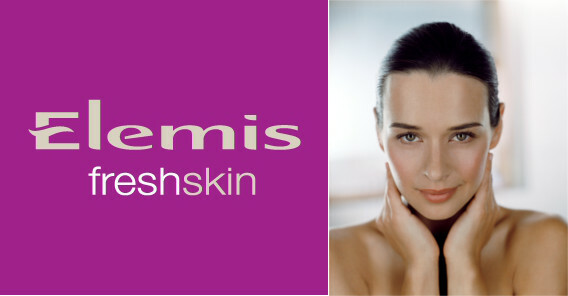 Skin is left incredibly clean, smooth and radiant, bringing a renewed level of evenness and clarity to the complexion. This Brightening Facial restores even skin tone, illuminates and brightens the complexion, leaving your skin feeling naturally even and translucently clear after just one treatment. This newly created innovative therapy from Elemis targets individual skin needs, whilst reducing visible dullness that can appear over time. Reduces the appearance of skin imperfections, brightens and evens skin tone, reduces oily shine and visible pores. Hydrates and softens the skin. This facial is the perfect pre-occasion treatment or simply if you want to rejuvenate your complexion. To combat ageing, stressed and slackened skin. A nutritional boost rich in superfoods and essential minerals designed to pack stressed, dull skin with energising, detoxifying actives. Clinically proven* to leave skin plumper, radiant and lit up with good health. Moisturisation levels of the skin are proven to increase by up to 61%* and elasticity by 40%* after just 1 treatment. Specialised micro-circulatory massage techniques are combined with powerful formulations and the two-phase Amino Active Mask to help smooth, sculpt and restore skin radiance. Anti-wrinkle facial with proven results. This exceptional anti-wrinkle facial has been independently tested, with phenomenal results. Clinically proven, after just 1 treatment, this facial reduces the number of wrinkles by up to 94%* and improves skin firmness by up to 57%*. Specialised lifting massage techniques are combined with professional strength anti-ageing formulations for maximum treatment efficacy, leaving a firmer, uplifted, more youthful looking appearance. Super lifting facial for sagging jowls, cheeks, chin and neck. Powerful lifting techniques target sagging jowls, cheeks and chin, whilst helping to reduce the puffiness and fluid retention associated with sagging skin along the jawline. The facial contours instantly appear shaped, lifted and firmed. A new anti-wrinkle facial with immediate results. Powerful mineral ingredients and unique facial massage techniques help to lift and firm the skin. Padina Pavonica marine algae, empowered by electrical energy from Quartz, visibly revitalises by promoting cellular activity. This anti-ageing face and eye treatment instantly firms, rejuvenates and plumps skin, whilst helping to reduce dark circles. Specialised micro-circulatory massage techniques are combined with powerful formulations and the two-phase Amino Active Mask to help smooth, sculpt and restore skin radiance. Clinically proven after just one treatment: This unique treatment targets blemishes, uneven skin tone, superficial scarring and fine lines, revealing a younger looking skin. Advanced resurfacing techniques safely and effectively remove the thickening layer of epidermis revealing a radiant complexion.